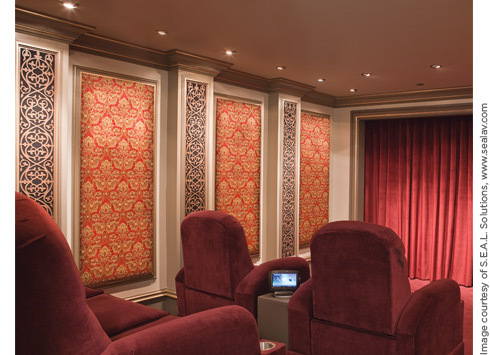 Most decorative wall upholstery fabrics are not made with home theater in mind. They are too dense to allow sound to reach the acoustical treatments or speakers behind them. This designer-friendly, specially-woven and tested collection of acoustical fabrics features a wide variety exciting design patterns and colors and can be used safely over both acoustical treatments and speakers. "We are extremely excited about the launch of the new CINE Living fabric series. For the last decade, working with designers like Theo Kalomirakis, we have certified a variety of fabrics from many top brands as being acoustically transparent; but never before have we seen such a wonderful collection of great looking and acoustically acceptable offerings. I truly look forward to seeing the CINE Living fabrics become a staple in our offerings to our clients and their designers!"